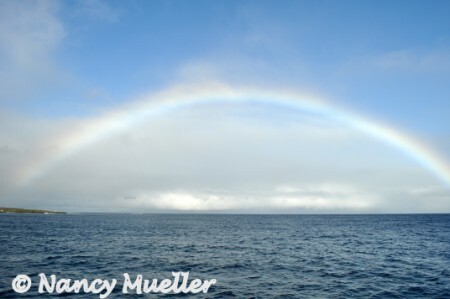 Call it the luck o’ the Irish, but I’ve had the good fortune to capture a few beautiful rainbows in photos on my small-ship cruises and travel expeditions. See for yourself . . .
How about you, Wanderboomers? 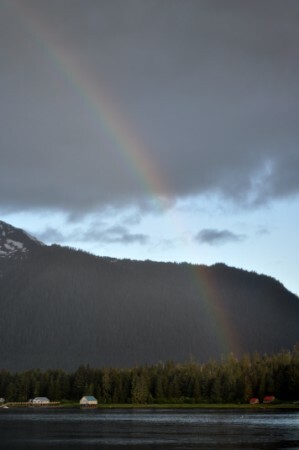 Seen any great rainbows in your travels? Oh these are so cool! The reason I wanted my first camera was for taking rainbows! Brings back memories. Glad you enjoyed these photos as much as I enjoyed taking them, Samantha! It pays to be Irish, Beth! When I was a kid, I used to beg my parents to keep driving until we found the pot of gold at the end of any rainbow we saw :-). You know…I actually flew through a rainbow and broke it into pieces. Let me tell you how this happened. My husband and I were flying with Norm Dove (owner of Echo Valley Ranch in B.C.) in his little Dehavilland Beaver when he saw a rainbow. As he flew toward it, it didn’t recede like rainbows always have (in my experience, at least). it got bigger and bigger until we were flying through it and it broke up into colorful fragments which gradually formed back into a rainbow arch behind us. I’m sure a scientist could explain this but to me it seemed magical. I especially love the one from Ecuador! When I lived in Hawaii I used to see many rainbows. I really treasured them, especially when I saw a double one. 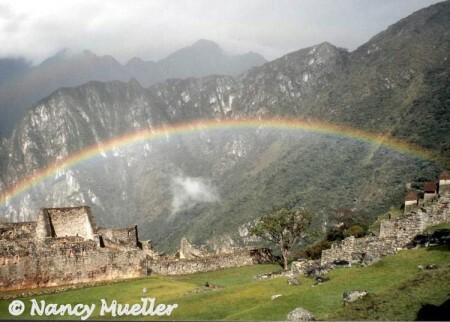 Freelance travel writer Nancy Mueller’s articles have appeared in Hemispheres Magazine, Uptake, GoNomad and Wanderlust and Lipstick. 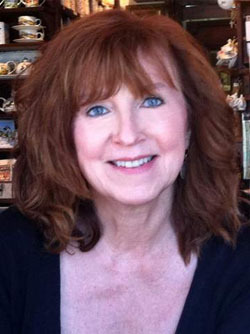 Nancy is the author of Work Worldwide: International Career Strategies for the Adventurous Job Seeker (Avalon Travel Publications), and her class, “Travel Writing for Fun and Profit” has been a popular program in the Seattle area for several years. When this WanderBoomer isn’t traveling, she helps global executives polish their communication skills. 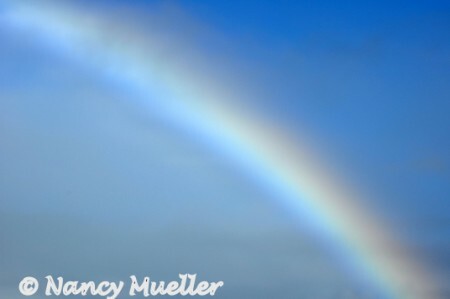 Find out more on www.NancyMueller.com.